Having a backyard means getting out to enjoy the sunshine and fresh air with family and friends. Barbequing, lounging by the pool, planting flowers in the garden, etc.. However what usually comes with beautiful nature and fresh air, is the variety of insects and more particularly, BEES! These little guys are not usually a threat – they’re just looking for nectar to make honey. A hive, however, should be dealt with especially if it’s too close to your home. If you have a bee colony you want to get rid of, an exterminator is NOT the best answer. Instead, contact a bee removal expert who can capture the queen and put the colony to good use! Honeybees rarely sting unless provoked (usually if they feel the colony is threatened) Honey bees can only sting once and then die shortly after. ALERT: These insects are considered vital pollinators within their ecosystem (and for farming, too), it’s best to relocate these bees rather than kill them. Contact a professional beekeeper for assistance in this! These slow flyers are often seen visiting flowers in a garden. 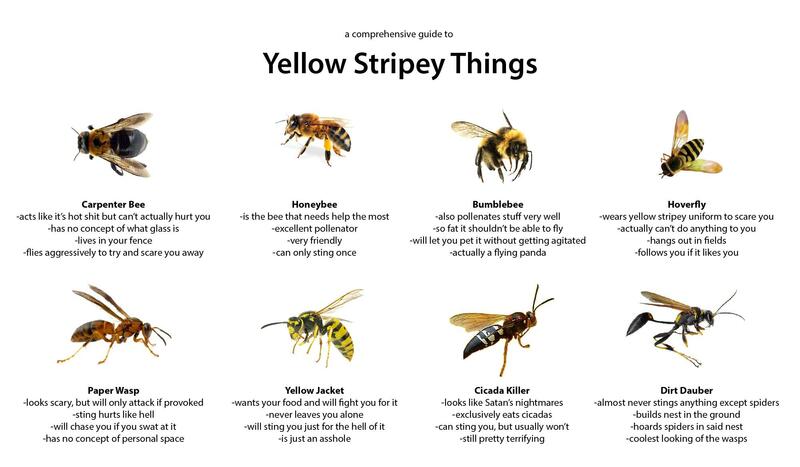 Most of these fuzzy, oversized bees are black and yellow, though some also have a tint of orange. Bumblebees live in small colonies, and they defend their nests quickly by stinging and pursuing threats to save their hives. They build their nests out of pollen clumps, usually in the ground or a dense grass clump. Their stings are known to be painful -however, they rarely sting while rummaging in flowers, just in defense. These are highly aggressive insects! They develop large colonies that are intensely defended. As a result, people can be swarmed in a matter of minutes, often getting stung hundreds of times. These insects are especially fond of hunting in and around trash piles and garbage cans. They are a common invader to outdoor picnics! Daubers are solitary insects most known for their habit of building nests out of the mud. They are capable of stinging, however unlikely to do so – even when disturbed (aww). They’re not aggressive, and they do not defend their nests as social wasps do. I’ve Been Stung! What do I do? Unless you’re allergic, most bee stings can be treated at home!